Do you have a problem of a Regency nature? Are you suffering from an excess of Pride, Prejudice, Sense or Sensibility? Does nobody have any sympathy for your poor nerves? Could a fictional Jane Austen character be the very person to give you the advice you need on your 21st century issues? 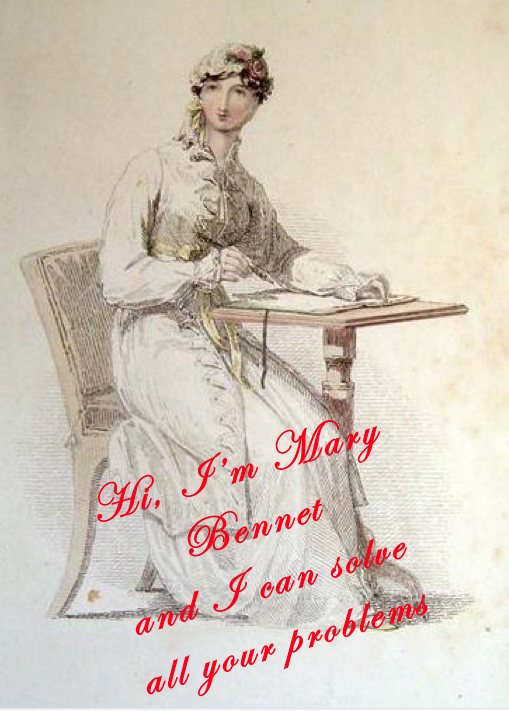 Just type your question or problem into the reply box below, or use the feedback form and Mary Bennet herself will come back to you in no time with some really sound advice. All delivered with complete confidentiality. And free of charge! You can find Mary’s answers by hovering over the Ask Mary tab at the top of this page…..! How exciting! I wonder if you can advise me? Persons of a less punctilious persuasion than myself have recently made rude and hurtful comments that I demonstrate an excess of zeal in maintaining order in the household. Apparently, my insistence upon straightened cushions and perfectly drawn curtains is too exacting. I fail to understand how observing high standards of tidiness can be deemed a failure.